In this unforgettable portrait of human frailty and resilience, Kristin Hannah reveals the indomitable character of the modern American pioneer and the spirit of a vanishing Alaska-a place of incomparable beauty and danger. 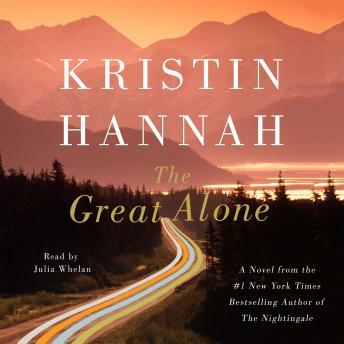 The Great Alone is a daring, beautiful, stay-up-all-night audiobook about love and loss, the fight for survival, and the wildness that lives in both man and nature. Sorry, this book was a real downer. This is a story about a family who is in trouble...big trouble. A husband with PTSD, a wife who takes the brunt of it , a relationship with poor decision making skills. A daughter who grows up with turmoil. The descriptions of Alaska and the wild beauty that exists there was the best part. Awesome book. Loved every minute. Kristin Hannah is a wonderful writer. The narrator was totally captivating. I am going to listen again. Unbelievably captivating and one of the best books I have ever read. I will give it 4 stars for being predictable and slow at times. It was a good book. The narrator made this extremely exciting. I have to agree with some of the other reviews - the book was extremely depressing. I felt the same depressing things were being repeated over and over. I thought the narration was good but the subject was a downer. I love the author but found this book to be painfully slow. The fact that the narrator was flat didn’t help. If I had been reading the book, I surely would have not finished it. This was not my favorite book. I thought it dragged out too long. Captivating story, easy listening, well developed characters. One minute you’re shaking your fist at them and the next minute giving them a hug. Beautifully written but it was predictable, painfully slow and seemed to drag on and on and on. I first read Kristin's 'The Nightingale' & for not being a big reader, I LOVED it! I bought the Great Alone but couldn't find the time to sit & read. I downloaded the audio book for my road trip & I finished it in 3 days. I'm sad it's over and keep thinking about the characters.The narrator was fabulous, really created a picture in my mind. The story is sad, but let's face it life's hard! The love, passion & dedication of the characters to one another is special :) Highly recommend!